In rural New Mexico, some 200 students spent the spring and summer harvesting herbs, playing with lie detectors, and learning their way around Photoshop. Such rich programming in science, technology, engineering, and math (STEM) was a far cry from the typical offerings in Grant County, a small region in the southwest corner of the state where enrichment programming in the sciences can be hard to come by. Overall, New Mexico ranks in the bottom five nationally for science education and second for child poverty. The rural county’s schools are particularly under-resourced. “The kids are really starting with a lot of strikes against them,” said Dave Chandler, director of community outreach and development at the Aldo Leopold Charter School District in Silver City, the Grant County seat. In the city of around 10,500, about an hour from the Arizona border, more than a quarter of the residents live below the poverty line. Surrounded by dedicated teachers and kids with high potential, Chandler always wished the community could provide students with engaging, hands-on STEM education. Many of his students have “science and math phobias,” he said, likely because in the past they haven’t been exposed to science content they found engaging. But he believed that given the opportunity, students in Grant County would want to dive deeply into those subjects. When Chandler heard about the National Writing Project’s LRNG Innovation Challenge grant, he saw an opportunity to bring together a handful of schools and community partners in Grant County with the common goal of providing fresh STEM programming across the county. In 2014, LRNG awarded grants to 14 groups of educators working on expanding time and space for creative and connected learning in schools. The grants grew from a partnership among the National Writing Project, John Legend’s Show Me Campaign, and the John D. and Catherine T. MacArthur Foundation to support educators. In Grant County, the award supported a two-part program aimed at providing STEM programming to kids throughout the county. First, in the spring, the grant funded “STEM labs” in two schools and three community sites, including a youth wellness center and a public library. Participating students, in grades 6 through 12, worked on unique STEM projects, among them computer science and the climate. Next, the summer STEM labs gave students of all ages the opportunity to work on similar projects during one- to four-week sessions at schools and partner sites. In some cases, the grant money allowed educators to create new STEM labs from scratch. In others, the funding “beefed up” established programs, Chandler said. The grant also paid for materials, additional staff, and visiting STEM experts. 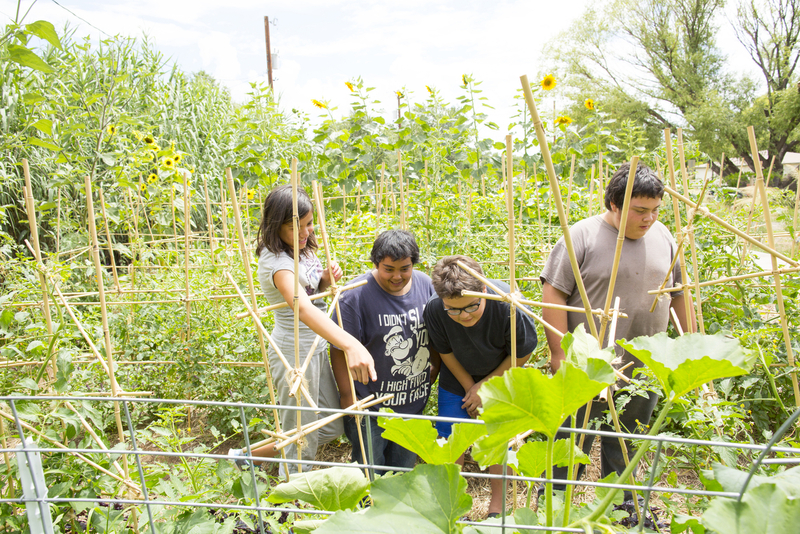 At the Guadalupe Montessori School, a week-long summer herbal workshop had elementary school students discussing endothermic reactions and hydrolysis, considering the role of medicine in society, harvesting and dehydrating herbs from the campus garden, and making soap, tea, and catnip toys. Another lab at the same school focused on irrigation. What was designed as a purely technical lesson morphed into a discussion about water conservation and ecology in the Southwest, said Frances Miller, program lead for the Guadalupe labs. Teachers at all the sites were more than willing to let the students take the lead. “The idea was not only would they have a cool activity to do, but they’d start seeing themselves as good at math and science if the setting is right,” Chandler said. His ambitions extended beyond the labs to the Grant County communities at large. To bring the joys of STEM learning to as many local kids as possible, some of the labs went public with their work. One group used pool noodles to build a giant DNA float that they debuted in a Fourth of July parade. The design team was made up of a kindergartener, a 6th grader, an 8th grader, and an 11th grader. The program was designed to forge bonds between the schools and organizations throughout the community. In Silver City, the program partnered with the public library. Kids in the existing summer reading program got treated to STEM lessons throughout the summer. In one lesson, they built their own lie detectors, learning about soldering and circuitry—and the impreciseness of such machines. One such expert was Shanon Muehlhausen, a Western New Mexico University math professor who came to the library to teach the summer reading kids about topology. When the STEM labs program culminated in early August, families of summer participants got together for a final showcase where they presented on their work. Students also received free school supplies, which their families often can’t afford, Chandler said. Later in the month they were able to return to school as more confident STEM learners, with fresh supplies and a summer of science under their belts.